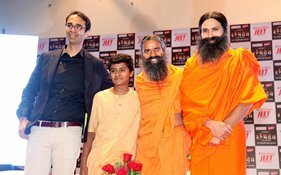 New Delhi, February 07, 2018 -- Discovery JEET, the eagerly awaited new entertainment channel from Discovery India with meaningful content spanning biopics, historicals, crime and comedy, is all set to showcase Swami Ramdev’s never seen before inspirational life journey starting February 12, 2018 every weekday at 8:30 pm. Swami Ramdev is popular across the length and breadth of the country and beyond but little is known about his background. Where did he come from? What are his origins? What was his journey? In this official biopic, shot on locations in Rajasthan, Haridwar and Mumbai, Discovery JEET will narrate the Swami Baba Ramdev’s life story, from his start as a poor farmer’s son to becoming a national icon. Co-Produced by Ajay Devgn Flims and Watergate Production, Swami Ramdev’s life is symbolic of ‘Hai Mumkin’ attitude which forms the bedrock of Discovery JEET’s programming philosophy. Swami Ramdev: Ek Sangharsh’s trailer and TV campaign have generated immense interest on the social and have raked up an impressive 25 million plus views across YouTube and Facebook. Discovery JEET will launch with highest ever distribution, of more than 100 million households, in the history of GECs in India. The channel will be available on all leading DTH & Cable platforms across the country. With an aim to be India’s first national GEC, Discovery JEET will be available in Hindi, Tamil & Telugu languages. Discovery Communications India (DCIN) has signed Netflix as the exclusive global OTT platform partner for the content of Discovery JEET. The deal will ensure that Discovery JEET’s marquee content, with English subtitles, will be available to audiences in more than 190 countries world-wide. Netflix communities globally will be able to binge-watch each series after it is aired on the Discovery JEET channel in India. Discovery Communications India, the country’s leading infotainment player, is dedicated to satisfying curiosity, engaging and entertaining viewers with high-quality content through its portfolio of 12 channels including Discovery Channel, TLC, Animal Planet, Discovery HD World, Discovery Science, Discovery Turbo, Discovery Kids, Discovery JEET, Animal Planet HD World, TLC HD World, Discovery Tamil and a premium sports channel DSPORT. From survival to natural history, wonders of science to extreme jobs, motoring to travel and lifestyle, and the latest engineering marvels to live sporting events, each channel offers distinct must-watch programming to engage viewers across the country. Discovery Communications India will launch a new GEC channel ‘Discovery JEET on February 12, 2018’. The new channel will be the flagship for the network’s ambitious investment into original local productions in India. Discovery JEET will bring together Discovery’s unmatched story-telling and the best of real-life entertainment through larger than life stories aimed at inspiring millions. Swami Ramdev: Ek Sangharsh is a scripted biopic series tracing Swami Ramdev’s never seen before, inspirational journey from a life of anonymity to a renowned yoga guru, business guru and national icon. Ajay Devgn FFlims and Watergate Production are the co-producers of the show featuring National Award winner Naman Jain as Ramkishan (Young Ramdev) and Kranti Prakash Jha as Swami Ramdev.